A healthy baby. It’s what every intended parent wants. Being successful on the first attempt is what every IVF patient wants. IVF is a stressful and frequently costly process. Adding donor eggs to the equation can compound the stress, cost, and complexity. Compared to IVF with a woman’s own eggs, donor egg IVF provides the opportunity to make certain choices that can increase the chance for success and a healthy baby on the first attempt. It is important they understand what factors can impact on their chance for success so that intended parents know what to look for and the questions to ask. 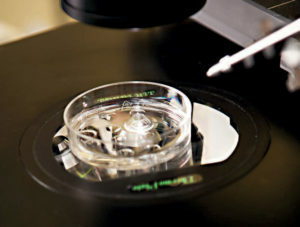 Availability, waiting times, cost, ease of accessing treatment, physical and ethnic characteristics, a personal background such as education and interests, reasons for donating, and anonymous versus known donation are all typical considerations forefront in intended parents’ minds before starting donor egg IVF. Sometimes intended parents won’t be able to choose or know some of these elements based on where they live or where they pursue treatment. In many locations, such as in the UK, intended parents’ choices and access to potential donor information will be limited. In others, such as in the USA, much more potential donor information and options will be available. While these are all important factors for intended parents to consider in donor egg IVF, none of them directly impact on their chance of success and a healthy baby. In all IVF, including donor egg, success is directly correlated to having a sufficient number of genetically healthy and chromosomally normal embryos. Understanding what choices they can make with this in mind is key. There is no single number of embryos that defines “sufficient”, but generally more is better as this provides intended parents more options if they hope to have more than one child and greater assurance if their first attempt is not successful. Three elements merit highlighting as they can directly contribute to the goal of having a sufficient number of genetically healthy and chromosomally normal embryos: genetic screening pre-donor selection; medical indicators of the donor; and transferring chromosomally normal embryos. Donor screening and approval by their IVF clinic as well as treatment choices made by intended parents are both critical elements in achieving this goal. Confusingly for intended parents, donor screening, approval protocols, and available treatments can differ widely between clinics in different countries and even within the same country. The fact of selecting an egg donor allows intended parents the unique opportunity to look after the future health of their family. Appropriate genetic screening pre-donor selection allows intended parents to choose a donor that is a good match with the sperm provider from a genetic health perspective. Family History Screening: It is important for a genetic counseling expert to screen the potential donor’s and sperm provider’s family histories to look for anything that might be associated with increased risk for genetic disease, birth defects, learning problems/autism, and adult-onset disorders in the future offspring conceived using a particular donor’s eggs. If this screening indicates a potential risk, intended parents can choose to select another donor with whom there is no evidence of similar concerns. Genetic Disorder Carrier Screening: Virtually everyone is a carrier for some recessive genetic disorder, though they may have no signs of the disorder and there may be no family history of the disorder. Some genetic disorders are more common in certain ethnic groups. Many are debilitating or life-threatening if a baby is born with the disease. When the egg donor and sperm provider are carriers for the same disorder there is a 25% chance that any baby born from that match will have that disease. Screening an egg donor and the sperm provider can indicate whether both are carriers for the same genetic disorder and therefore may not be a good match. In this case, picking a different egg donor who is not a carrier for the same disorder as the sperm provider can ameliorate the risk. This form of screening is possible with a blood or saliva sample and is available through various tests that screen for different panels of genetic disorders to varying degrees of accuracy. There is a correlation between the number of mature eggs retrieved from a donor and the chance of ultimately having a sufficient number of genetically healthy and chromosomally normal embryos. As there is a natural diminution from the number of eggs retrieved to the number that fertilize, grow to the blastocyst stage and are chromosomally normal, generally speaking, the more eggs mature retrieved the better. As a consequence, some donors are simply medically better suited for the donation process. Whether a woman is finally approved to be a donor will depend on how rigorous a clinic is in their medical screening and approval process. Age: A woman’s peak fertility is during her 20s. As she ages, diminished ovarian reserve and the rate of chromosomally abnormal (possessing extra or missing chromosomes) embryo formation make it less likely that her eggs will result in a healthy baby. From 35 years of age, these two factors increase significantly. In some countries, the average age of donors approved by clinics tends to be higher than in others. Body Mass Index (BMI): When a woman’s BMI is more than 29 the effectiveness of the fertility medications that stimulate her ovaries may be reduced, leading to a risk of fewer mature eggs being retrieved. Increasing the doses to compensate for reduced effectiveness can raise the risk of Ovarian Hyperstimulation Syndrome which can endanger the health of the donor. Donors with a healthy BMI of between 19 and 29 will have the best chance of optimal response to stimulation. Ovarian Reserve: A woman’s ovarian reserve is the capacity of her ovaries to provide eggs capable of fertilization. Basal Antral Follicle (BAF) count and Anti-mullerian Hormone (AMH) are two measures that can help assess ovarian reserve. BAF count uses a transvaginal ultrasound to count the number of follicles that contain immature eggs capable of being stimulated. A higher number of follicles is an indicator that more eggs may be able to be retrieved for donation. AMH is produced by the follicles growing in a woman’s ovaries and women with higher levels tend to respond better to the stimulation and have a greater number of eggs retrieved. Generally speaking, donors with higher BAF and AMH test results will have better chances of more mature eggs being retrieved. Prior Donation Information: If a woman has donated previously and the details of her prior egg donation(s) are available, this can give a good indication of the potential for future success. The details of a woman’s prior egg donation(s) can be more insightful that ovarian reserve testing which is most important for first-time donors. Relevant factors include the number of eggs retrieved; the fertilization and 5-day blastocyst formation rates; the rate of normal embryo formation if analyzed; and ongoing pregnancy or live birth outcomes for other intended parents. In addition, information from her prior donation may indicate her responsiveness to the fertility medications and whether dosage protocols may be adjusted to optimize results. In some countries, this type of information on donors will be available to intended parents to consider as part of their choice of donor. In any case, intended parents should understand the screening and approval standards of the IVF clinics they are considering. The formation of chromosomally abnormal embryos is a natural phenomenon. Around 25% of embryos from a young woman’s eggs can be naturally abnormal and this rate increases with age. In some cases, even with a young women’s eggs, this rate may be higher. Transferring a chromosomally abnormal embryo is the most common cause of failed implantation and miscarriage in IVF, or can lead to a pregnancy and birth of a baby with a disorder linked to chromosomal abnormality (such as Down’s Syndrome). It is not possible to assess whether an embryo is chromosomally normal from a visual assessment. Testing embryos with Comprehensive Chromosome Screening (CCS) is the only way to know which embryos have screened as chromosomally normal and will provide the best chance for success and a healthy baby. In addition to these three elements, overall excellence in IVF – including customizing treatment protocols and the quality of an IVF clinic’s laboratory – will play a significant part in any IVF patient’s chances for success on their first attempt. As with most things, all IVF and all donor egg IVF is not equal. Intended parents should arm themselves with the knowledge they need to fully evaluate prospective IVF clinics and their egg donor programs so that they can choose for success.